Hey everyone...I have a job. I know...cry for me. But on the plus side I'll get to go back to blogging on a semi-normal regularity once I get going next week. Oh, and I'll get to keep my house too...so bonus. The last one gets a slap rather than a slug, maybe? Does anyone else think it is lame of VW in their latest ad campaign to try to get the game going for ANY VW? Congratulations on the new job! And I hated this game, probably because I was the little sister and wasn't as fast and couldn't hit as hard as my brother! Yippee on getting a job and coming back on a semi-regular basis. I've been lost without you. Oh and very happy you get to keep a roof over your head and your computer. Yippee again. I have never played the slug bug game and it is a good thing cause I would have beat the heck out of anyone hitting me every time they saw me get into my bug. The first car I owned was a VW and it will not be the last car I own since I have moved on to Honda's. 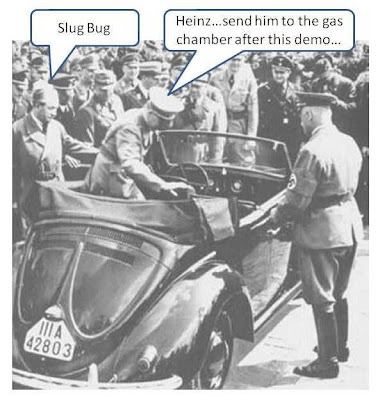 But I might reconsider it if I ever had a chance to own that halfass VW bug in the last pic. That one would just be too cool to pass up. But I do have to say that I loved my bugs. I really do wish I still owned a few of them. Soooo you're selling cars? Regardless, congrats on the job. I'm still waiting for one to fall out of the sky on me. Unemployment lasts only so long. 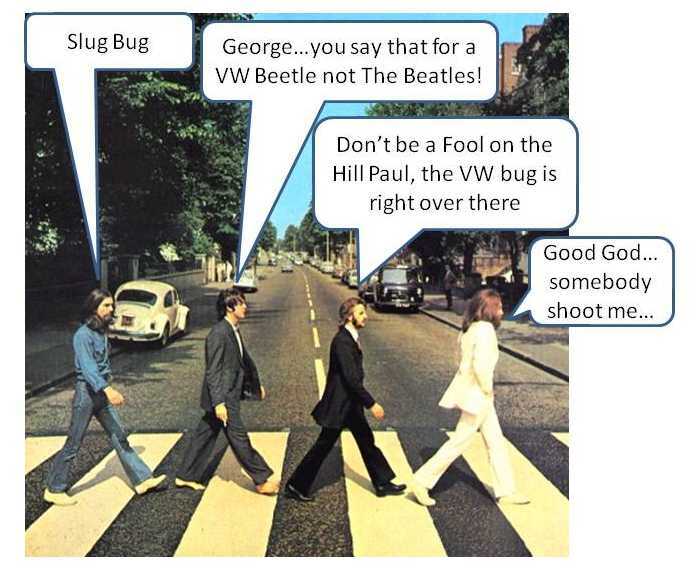 It's called "Punch Buggy" up here. I wanna hear more about the job! Do you remember how to "work"? No, that's not right, either. We called 'em Punch Buggies. 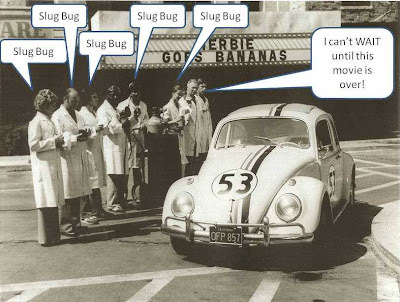 I might be the only person on the planet who has never done the "slug bug" thing. I didn't even KNOW about it til a couple weeks ago when some friends explained it to me. YAY! VE gets to go to work! Are you driving there in a bug? well, i'm back from my trip and i see I haven't missed much around here. Never heard of "slug bug" until recent commercials - and I drove a 69 beetle. Great news on the new job. Best of luck. Awesome news about the job. I have one, I hate it, I'm looking, It's hard and hey . . my first car was a bug and I loved it. i had a friend who said 'perdiddle'--everytime she saw a car with one headlight out. Congrats on the job! It's always a bonus if you get to keep your house. Congrats on the job! Now I can hit you up for a loan. That's harsh VE, just harsh! 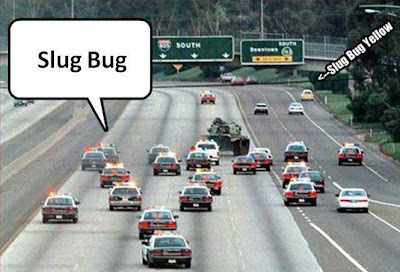 And I happen to like the last slug bug. Monkey man – They are falling out of the sky too…watch where you walk! Perpetual chocoholic – Punch buggy? Wasn’t that back in the 1800s when they HAD buggies? Reforminggeek – Do stink bugs really stink? Do doodle bugs really doodle? I want answers! Anne – Sheesh…what were you expecting…I got a job! Where did you go? Aladdinsane12 – Of course…it all makes sense now, doesn’t it? Tom – I knew somebody who drooled without knowing it…perhaps they’re the same person? 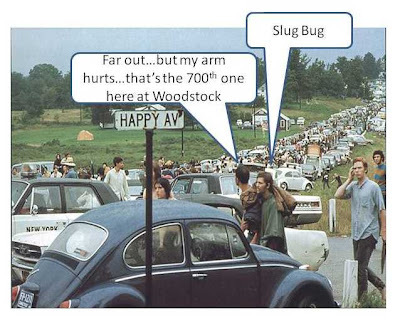 I had a VW bug in college. No one ever hit me because of it. Probably because I would have hit them back, harder. Nope. Never played this game. Honest! Tom's comment reminded me that we did the "PaDiddle" thing in college too. The idea was to wait til you saw a car with a headlight burnt out, then you hit the roof of the car as fast as you can while saying "PaDiddle!" The last person to hit the roof and shout the word has to buy drinks for everybody else. An auxiliary version of this was to shout "Leddidep" if you saw a car with a taillight out. Sometimes we actually went to class and, like, studied and stuff too. Ha! We used to call them "punch buggies" and call out the color of the VW beatle before we would punch the arm of the person near us. And to answer The Incredible Woody's comment - I have to agree that it is lame for Volkswagen to try and change the game to include ALL makes of their autos. They should not be allowed to change the rules for a game that the public (as far as I know) came up with. Hi VE!!! you have a job???? welcome to the dark side. Janna – That’s just alien! Teeni – You sure you don’t want to do all of my comment replies? We play slug bug in the redwoods, although it works in the Oregon Coast Range mountains, as well. 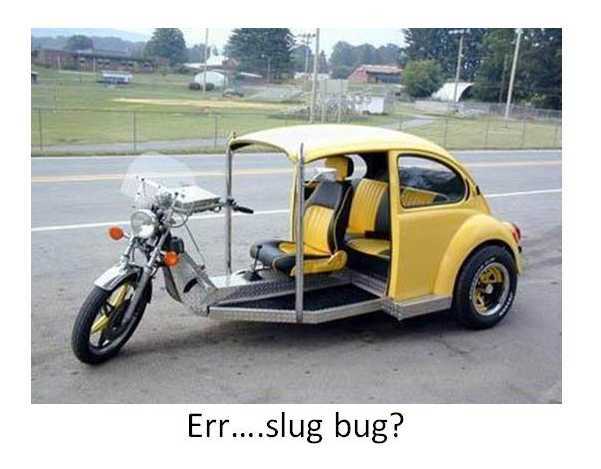 It's always "slug bug yellow!" though.